Montana has fined a subsidiary of insurance giant QBE following what the state indicated were both improper and sloppy steering practices. How sloppy? Unigard, according to the Montana Commissioner of Securities and Insurance/State Auditor’s Office, actually sent non-preferred shops the evidence indicating they were on an internal “DO NOT USE” list. And just to compound the apparent sloppiness, Unigard never bothered to respond to the state’s Jan. 7 notice of action, Democratic Insurance Commissioner Monica Lindeen wrote in ordering a $25,000 fine and issuing a cease and desist order March 23.
d. generating shop-specific claim system notes to advise Respondent’s representatives to discourage or prohibit claimants from using a specific body shop. “(As) part of our overall corporate communications policy, we do not comment on legal matters,” a QBE spokeswoman wrote in an email when asked for comment. Lindeen’s distinction of “reasonable and necessary cost to repair the covered damages” is a key point here, and other state regulators, insurers, consumers and shops might want to keep this case in mind. A Unigard policyholder in 2014 rear-ended a 1997 Jeep Wrangler driver, whose father mostly handled the interactions with Unigard for the repair. The father sought an estimate from Butte, Mont.-based Yates Body Shop, which transmitted it and photos to Unigard. Unigard told the father that Yates Body Shop wasn’t approved, and the father “needed to go to a Respondent-preferred body shop,” according to the agency’s attorneys. 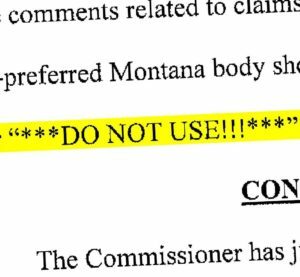 Unigard asked the father to go to another Montana body shop, and the father later told the agency that “he felt ‘pressured to get another estimate to go to [Respondent’s] preferred shop,'” the insurance department wrote. The father, however, talked to Yates Body Shop after getting an estimate from the preferred shop, leading Yates Body Shop to remind Unigard that steering was illegal in Montana. Unigard relented, but at some point also made the mistake of sending Yates Body Shop and another Montana shop claims documents with Unigard/QBE’s own internal messaging. “In both cases, the statements ‘***DO NOT USE***’ or ‘***DO NOT USE!!! ***’ are indicated next to each shop’s name,” Lindeen wrote. It’s unclear if the “DO NOT USE” incident was related to the Jeep Wrangler case discussed by the state. “We constantly battle with QBE,” said Yates Body Shop owner Max Yates, who said the company sometimes uses independent appraisers unfamiliar with the antisteering and estimating laws in the state. Steering generally was “probably the toughest challenge anybody has,” Yates said. “We’re not in the wrong when we’re charging for necessary procedures,” he said, but insurers chafe at this and the shops’ fights for more favorable state collision repair policies.